Objective To compare the effects of a programme of load management education plus exercise, corticosteroid injection use, and no treatment on pain and global improvement in individuals with gluteal tendinopathy. Design Prospective, three arm, single blinded, randomised clinical trial. Setting Brisbane and Melbourne, Australia. Participants Individuals aged 35-70 years, with lateral hip pain for more than three months, at least 4/10 on the pain numerical rating scale, and gluteal tendinopathy confirmed by clinical diagnosis and magnetic resonance imaging; and with no corticosteroid injection use in previous 12 months, current physiotherapy, total hip replacement, or neurological conditions. Interventions A physiotherapy led education and exercise programme of 14 sessions over eight weeks (EDX; n=69), one corticosteroid injection (CSI; n=66), and a wait and see approach (WS; n=69). Main outcomes Primary outcomes were patient reported global rating of change in hip condition (on an 11 point scale, dichotomised to success and non-success) and pain intensity in the past week (0=no pain, 10=worst pain) at eight weeks, with longer term follow-up at 52 weeks. Results Of 204 randomised participants (including 167 women; mean age 54.8 years (standard deviation 8.8)), 189 (92.6%) completed 52 week follow-up. Success on the global rating of change was reported at eight weeks by 51/66 EDX, 38/65 CSI, and 20/68 WS participants. EDX and CSI had better global improvement scores than WS (risk difference 49.1% (95% confidence interval 34.6% to 63.5%), number needed to treat 2.0 (95% confidence interval 1.6 to 2.9); 29.2% (13.2% to 45.2%), 3.4 (2.2 to 7.6); respectively). EDX had better global improvement scores than CSI (19.9% (4.7% to 35.0%); 5.0 (2.9 to 21.1)). At eight weeks, reported pain on the numerical rating scale was mean score 1.5 (standard deviation 1.5) for EDX, 2.7 (2.4) for CSI, and 3.8 (2.0) for WS. EDX and CSI participants reported less pain than WS (mean difference −2.2 (95% confidence interval −2.89 to −1.54); −1.2 (−1.85 to −0.50); respectively), and EDX participants reported less pain than CSI (−1.04 (−1.72 to −0.37)). Success on the global rating of change was reported at 52 weeks by 51/65 EDX, 36/63 CSI, and 31/60 WS participants; EDX was better than CSI (20.4% (4.9% to 35.9%); 4.9 (2.8 to 20.6)) and WS (26.8% (11.3% to 42.3%); 3.7 (2.4 to 8.8)). Reported pain at 52 weeks was 2.1 (2.2) for EDX, 2.3 (1.9) for CSI, and 3.2 (2.6) for WS; EDX did not differ from CSI (−0.26 (−1.06 to 0.55)), but both treatments did better than WS (1.13 (−1.93 to −0.33); 0.87 (−1.68 to −0.07); respectively). Conclusions For gluteal tendinopathy, education plus exercise and corticosteroid injection use resulted in higher rates of patient reported global improvement and lower pain intensity than no treatment at eight weeks. Education plus exercise performed better than corticosteroid injection use. 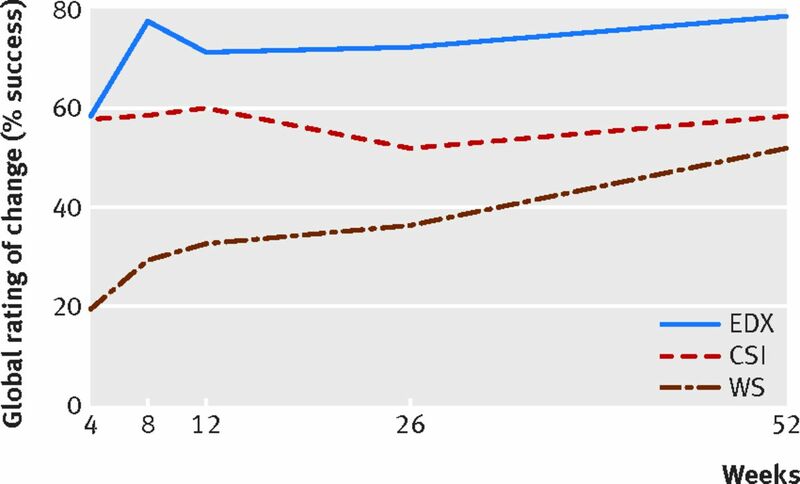 At 52 week follow-up, education plus exercise led to better global improvement than corticosteroid injection use, but no difference in pain intensity. These results support EDX as an effective management approach for gluteal tendinopathy. Trial registration Prospectively registered at the Australian New Zealand Clinical Trials Registry (ACTRN12612001126808). Gluteal tendinopathy, often referred to as greater trochanteric bursitis or greater trochanteric pain syndrome, has a prevalence of 10-25% and is experienced by one in four women aged over 50 years.12 The disorder presents as pain and tenderness over the greater trochanter and often interferes with sleep and physical function. The level of disability and quality of life is equivalent to that of severe hip osteoarthritis,3 and effective management strategies are required. 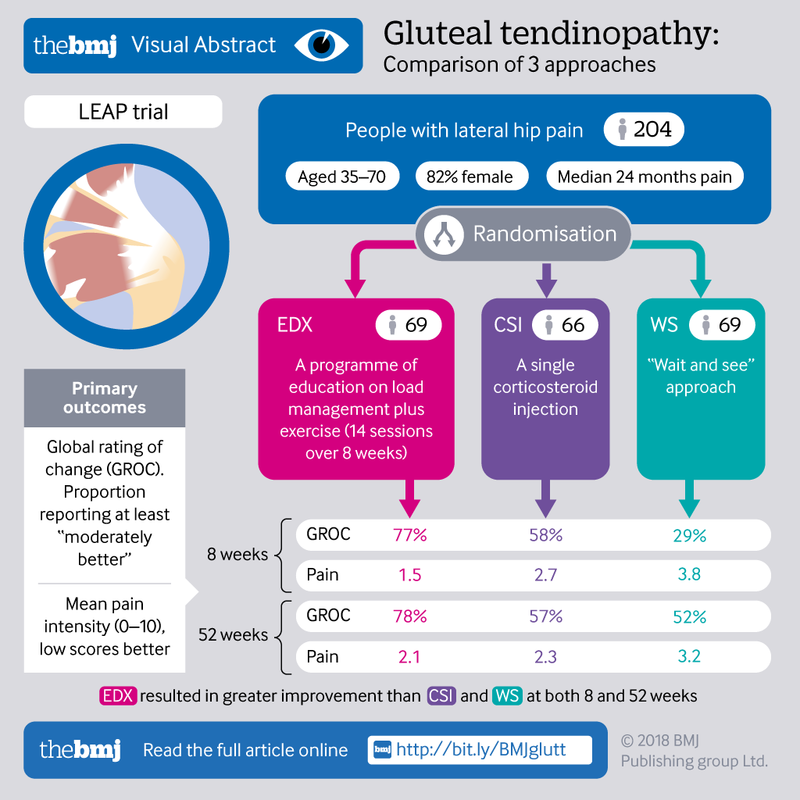 We conducted a randomised clinical trial to compare the effects of a programme of education about tendon load management plus specific exercise,8 a single corticosteroid injection, and a wait and see approach on pain and global improvement in individuals with gluteal tendinopathy. The hypothesis was that both education plus exercise and corticosteroid injection use would be better than a wait and see approach in the short term (after eight weeks), whereas education plus exercise would be better than corticosteroid injection use in the longer term (after 52 weeks). This multicentre, parallel, three group, pragmatic randomised clinical trial was prospectively registered (Australian New Zealand Clinical Trials Registry ACTRN12612001126808) and the protocol published elsewhere.8 The trial adhered to the principles of the Declaration of Helsinki,9 with ethical approval obtained from the human research ethics committees of the Universities of Queensland (#2012000930) and Melbourne (ID 1238598). Participants provided written informed consent. Although no protocol deviations were made in the conduct of the trial, there were several minor variations in planned statistical analyses. These refinements included: specified multiple imputation; inclusion of the stratifying variable of study site in regression models; fitting of regression models separately at each time point; and for binary outcomes, use of binary regression models with a log link. These variations were published before close out of the study (https://espace.library.uq.edu.au/view/UQ:409744). A post hoc analysis of the pain data dichotomised the continuous interval scale data on the basis of a clinically important difference, and was considered as a secondary outcome. Community dwelling participants were recruited from Brisbane and Melbourne, Australia, via advertisements in print, radio, and social media. Participants were not informed of the study hypotheses. 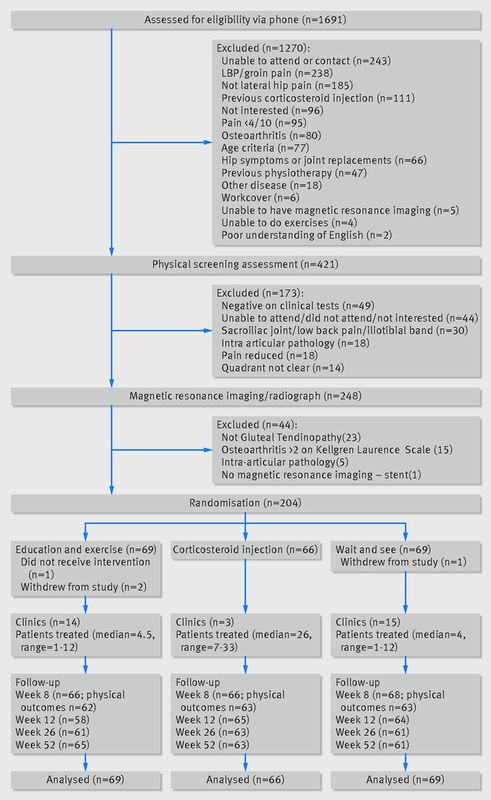 Inclusion criteria were: age 35-70 years, lateral hip pain for more than three months, pain intensity of at least 4/10 on a numerical rating scale (0=no pain, 10=worst pain), and clinical diagnosis of gluteal tendinopathy by a physiotherapist and confirmed by magnetic resonance imaging evidence of an intratendinous increase in signal intensity in the gluteus minimus and medius tendons on T2 weighted images of the hip.810 Major exclusion criteria were: low back pain, sciatic or groin pain intensity of more than 2/10 on a numerical rating scale, corticosteroid injection use within the previous 12 months, current physiotherapy, total hip replacement, and other neurological conditions (supplementary appendix S1). A wait and see approach. Allocations were sealed in opaque, consecutively numbered envelopes by an independent person not involved in recruitment, and kept in a central locked location. Envelopes were opened at each site sequentially. Using ultrasound guidance, an experienced radiologist administered the corticosteroid injections (1 mL Celestone (betamethasone 5.7 mg/mL) or 1 mL Kenacort A40 (triamcinolone acetonide 40 mg/mL) and local anaesthetic (2 mL bupivacaine or 1 mL Marcaine). Education plus exercise involved 14 individual sessions over eight weeks (60 mins initial session, 30 mins thereafter) with a registered physiotherapist. During these sessions, participants received education on tendon care, particularly on appropriate amounts and gradual progression of tendon loading (including handouts, DVD). They also received a home exercise programme of targeted strengthening of the hip abductor muscles and dynamic control of adduction during function (4-6 exercises to be performed daily). The wait and see approach involved attendance at one session with a physiotherapist who provided general information about the condition, possible risk factors, and advice regarding continuation of activity, as well as reassurance that the condition resolves over time. The treatments are described in detail in the protocol paper8 and summarised in supplementary table S2. Assessment of outcomes was performed at baseline, and at four, eight, 12, 26, and 52 weeks. The physical outcome measures (hip abductor muscle torque and active abduction lag) were performed only at baseline and eight weeks by a physiotherapist blinded to group allocation. All other follow-up assessments were done via postal questionnaires. The primary time points of interest were at eight and 52 weeks. The trial had two primary outcomes: global rating of change and pain intensity. We included a range of secondary outcomes, in order to comprehensively evaluate treatment effects for gluteal tendinopathy, and these secondary outcomes could provide grounds for further exploration. Primary outcomes were two valid and reliable self report measures.8 The global rating of change score was an 11 point numerical rating scale anchored by “very much better” or “very much worse,” on which participants rated the perceived overall change in their hip condition.11 Responses on the global rating of change scale were dichotomised, with success defined as “moderately better” to “very much better”—consistent with other studies of gluteal tendinopathy.45 Hip pain intensity was self rated as the average amount of hip pain experienced over the previous week, measured on an 11 point numerical rating scale, with anchors of no pain at 0 and worst pain at 10. Secondary measures8 included: pain and disability related to gluteal tendinopathy (that is, the VISA-G (Victorian Institute of Sport Assessment—gluteal tendinopathy) questionnaire,12 lateral hip pain questionnaire,8 and patient specific functional scale13); physical tests of hip abductor muscle strength (torque and active abduction lag, blind to treatment allocation); pain measures (pain self efficacy questionnaire,14 pain catastrophising scale15); as well as Patient Health Questionnaire 9,16 the Active Australia survey,17 and European quality of life-5D questionnaire (EuroQOL).18 In addition, we did a post hoc dichotomisation of the primary continuous pain outcome with respect to a minimal clinically important difference of 2/10 points19 (referred to as a clinically important pain reduction). We also collected information on adherence to the exercise programme (EDX; supplementary table S3), not per protocol treatments, and adverse events through participant diaries and physiotherapists records. All secondary measures are described in supplementary table S4. An independent statistician who was blind to group allocation performed analyses. The statistical analysis plan and data was determined a priori and are published and available on request (https://espace.library.uq.edu.au/view/UQ:409744). Sample size was based on the ability to detect a clinically relevant difference of 30% in success rate on the global rating of change scale between the two treatment groups and the wait and see group, eight weeks from baseline. This was determined by the Dunnett’s test procedure, accounting for a 15% loss to follow-up, a type 1 error rate of 0.05, any-pair power of 0.95, and all-pair power of 0.80. Assuming a success rate of 40% for the wait and see approach and 70% each for the education plus exercise and corticosteroid injection groups, we calculated the sample size at 67 participants per group, with a total sample size of 201. The Dunnett’s test procedure adjusts the required sample size to allow for the two comparisons with the wait and see group at the eight week time point. For continuous outcomes, we estimated the mean difference (95% confidence interval) between groups using linear regression models adjusting for group, baseline levels of the outcome, and site (Brisbane or Melbourne) for each time point. Binary outcomes were compared between groups using risk differences (95% confidence interval) calculated from binomial regression models with a log link, including terms for group and site at each time point. We calculated numbers needed to treat for binary outcomes from regression models for the risk difference, adjusted for the stratifying variable of site. P values were two sided, with significance set at 0.05. A patient representative at National Health and Medical Research Council programme grant meetings was involved in the planning and development of the present study. The burden of participation was not assessed after a participant’s involvement, but during recruitment and screening, all participants were asked if they were prepared to undergo all of the interventions and outcome measures. The results will be disseminated directly to all participants via email. Between March 2013 and September 2015, 204 participants were enrolled. Follow-up at 52 weeks was completed by October 2016 for 63 (95%) of 66 participants in the corticosteroid injection group, 65 (94%) of 69 in the education plus exercise group, and 61 (88%) of 69 in the wait and see group (fig 1). One participant in the education plus exercise group did not receive the intervention and two withdrew from the trial, one participant in the wait and see group withdrew, and all participants in the corticosteroid injection group received the intervention. Four participants in the corticosteroid injection group reported seeking physiotherapy or chiropractic treatment by 52 weeks, and two participants in the wait and see group reported having a corticosteroid injection by 52 weeks. Fifteen participants provided only the primary outcome measures via telephone at 52 weeks (seven, education plus exercise; three, corticosteroid injection; five, wait and see). Baseline characteristics were similar in the three groups (table 1). No participant or practitioner reported a serious adverse event. Reported average weekly adherence of all participants in the education plus exercise group to the prescribed programme, based on percentage of completed exercise sessions reported in the exercise diary, was always more than 80% (supplementary table S3). At eight weeks, all groups were different from each other in success rate (global rating of change) and pain (fig 2 and fig 3, table 2). The 77.3% success rate on the global rating of change scale for education plus exercise was greater than the 29.4% success rate of the wait and see approach (risk difference 49.1% (95% confidence interval 34.6% to 63.5%)). The 58.5% success rate of corticosteroid injection was also greater than the wait and see approach (29.2% (13.2% to 45.2%)). Education plus exercise had a greater success rate than corticosteroid injection use (19.9% (4.7% to 35.0%)). The number needed to treat for a difference in success rate was 2.0 (95% confidence interval 1.6 to 2.9) between education plus exercise and the wait and see approach, 3.4 (2.2 to 7.6) between corticosteroid injection use and the wait and see approach, and 5.0 (2.9 to 21.1) between education plus exercise and corticosteroid injection use. Participants reported less pain in the education plus exercise and corticosteroid injection groups than in the wait and see group (mean difference −2.2 (95% confidence interval −2.89 to −1.54); −1.17 (−1.85 to −0.50); respectively). Less pain was also reported in the education plus exercise group than in the corticosteroid injection group (−1.04 (−1.72 to −0.37), table 2). At 52 weeks, the 78.6% success rate in global improvement for education plus exercise was better than the 58.3% success rate for corticosteroid injection use (risk difference 20.4% (95% confidence interval 4.9% to 35.9%); number needed to treat 4.9 (95% confidence interval 2.8 to 20.6)) and better than the 51.9% success rate for the wait and see approach (26.8% (11.3% to 42.3%); 3.7 (2.4 to 8.8); table 2). The success rate for corticosteroid injection use did not differ from the wait and see approach (6.4% (−10.7% to 23.6%; P=0.46); 15.6 (−9.3 to 4.2)). The pain data showed a different effect profile at 52 weeks, with no difference seen between education plus exercise and corticosteroid injection use (mean difference −0.26 (−1.06 to 0.55)). Participants in both these groups reported less pain than those in the wait and see group (−1.13 (−1.93 to −0.33) and −0.87 (−1.68 to −0.07), respectively). Supplementary table 5 shows results of the secondary outcomes. At eight weeks, education plus exercise was better than the wait and see approach in all secondary outcomes, except for the active lag test and Active Australia questionnaire, which did not differ between groups. Corticosteroid injection use was also better than the wait and see approach in terms of clinically important pain reduction, function, disability and depression, but not quality of life, pain catastrophising, and self efficacy. Education plus exercise was better than corticosteroid injection use in functional outcomes, quality of life, and self efficacy measures, and also had less frequent pain and greater clinically important pain reduction. By 52 weeks, we found no differences between education plus exercise and corticosteroid injection use in any secondary outcomes, except that education plus exercise had less frequent pain than corticosteroid injection. Education plus exercise had better clinically important pain reduction, function, and quality of life, and less frequent pain than the wait and see approach. Corticosteroid injection differed from the wait and see approach on clinically important pain reduction, function (lateral hip pain questionnaire), pain catastrophising, and depression. As hypothesised, patients in our trial reported greater global improvement and lower pain intensity in the short term (at eight weeks) after education plus exercise and corticosteroid injection use for gluteal tendinopathy than after a wait and see approach. In addition, we found that outcomes were better for education plus exercise than for corticosteroid injection use at eight weeks. The hypothesis for the long term outcome (at 52 weeks) was only partly upheld, with patient rated improvement being greater for education plus exercise than for corticosteroid injection use, whereas we saw no difference in pain intensity between the two treatments. The results from the pain scale might be influenced by the relatively mild pain intensities at baseline, which could have limited this scale in detecting meaningful difference observed on the global rating of change scale, but should be considered in generalising from these findings. In proposing to implement these findings into clinical practice, our study had several limitations and strengths. Participants with gluteal tendinopathy were specifically selected on the basis of clinical diagnosis and confirmation by magnetic resonance imaging, with other musculoskeletal complaints excluded (such as low back pain or hip osteoarthritis), and the trial interventions focused on treating gluteal tendinopathy. Pragmatically, it is common for clinicians to encounter patients with multiple conditions, which would usually be dealt with in their management as well. Magnetic resonance imaging confirmation is not always available or affordable, but evidence indicates that some clinical diagnostic tests used in this study’s selection process have high diagnostic utility when compared with magnetic resonance imaging.10 Thus, use of these tests could improve confidence in selecting appropriate patients for the treatments used in this clinical trial. Differences in number of sessions and time spent with practitioners between the different groups could affect outcomes, but these interventions are designed to reflect conventional management protocols, and requirements and investment of time for each group are implicitly unbalanced. All physiotherapy and radiology clinics were community based, and treatments were generally well accepted by participants as demonstrated by the high retention rates and no major adverse events. Although blinded to study hypotheses, participants were not blinded to the treatments, which could have resulted in bias when completing the patient rated outcome measures, particularly because one group was a no treatment control. Only two measures were not patient rated outcomes: hip abductor muscle torque and active lag (at eight weeks only). These measures were recorded by an investigator blinded to group allocation. Analysis showed a small but significant difference in torque between education plus exercise and the wait and see approach. The potential for type 1 error due to multiple comparisons must also be considered. Adjustment to the significance level was not made, but P values for all comparisons are provided.22 Thus, the results concerning the secondary time points and outcomes might be considered exploratory. Notwithstanding, P values for the three primary comparisons would continue to be labelled as statistically significant if Bonferroni corrections for three pairwise comparisons were applied in a post hoc analysis. To progressively condition and strengthen the gluteal muscles in a specific manner to improve load bearing capacity of the musculotendinous unit (supplementary table S2). Adequate supervision to enable progression and correction of form and to directly address concerns and questions about the education information is likely to be important for the delivery of education plus exercise programmes26 and their relative benefits reported herein. Although education plus exercise had benefits over corticosteroid injection use at eight weeks, the hypothesis of its benefits in the longer term had mixed results at 52 weeks. 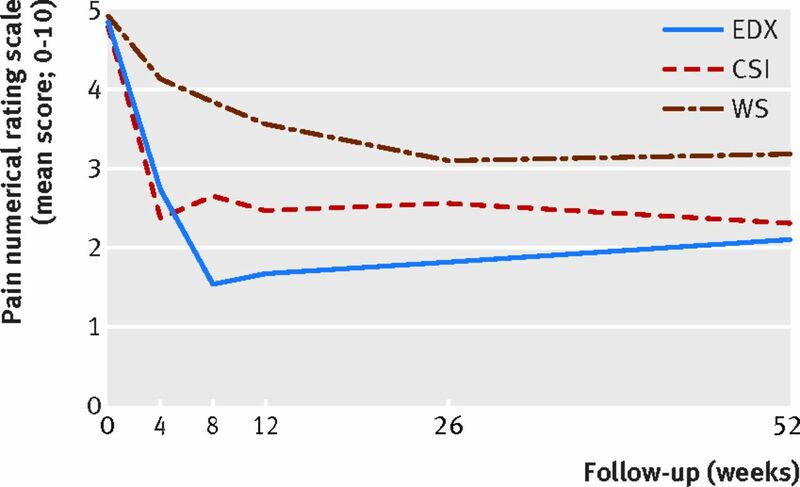 Success (global rating of change), quality of life (EuroQOL), and pain frequency, but not pain intensity or other gluteal tendinopathy specific measures (eg, VISA-G, lateral hip pain questionnaire, hip abduction muscle torque), indicated that education plus exercise was better than corticosteroid injection use. As a global impression of a participant’s perception of their hip condition over time, the global rating of change score might reflect less frequent pain and better quality of life rather than pain intensity and measures of disability specific to gluteal tendinopathy. Given that measures of muscle strength did not differ between groups at eight weeks, the mechanism underpinning the benefits of education plus exercise might well be more in the education aspect of the programme. The education component involved 14 sessions with a physiotherapist spread over eight weeks, with an emphasis on avoidance of postures and movements that compress the tendons against the greater trochanter as well as appropriately controlling and gradually progressing tendon loads. The information about posture, activity, and exercise provided in the education component could plausibly contribute to individuals feeling globally improved, with less frequent hip pain and better quality of life than after corticosteroid injection use and the wait and see approach. The strengthening exercises might have also contributed to improved motor control (which was not measured), direct analgesic effects, or improved tendon structure,2728 without measurable increase in strength—which could have underpinned benefits from the education regarding load management. Considering the favourable outcomes of an education plus exercise programme in both the short and long term, further research might be well directed towards establishing the degree of contribution of specific education alone about the condition itself, tendon loading principles, and appropriate strategies for self management. Future work should also look at whether this approach could be a viable, cost effective approach to early management and prevention of progression and recurrences. Understanding and knowledge of appropriate management strategies could encourage patients to have a greater sense of self efficacy and control over their condition, leading to improved quality of life. In gluteal tendinopathy, education plus exercise and corticosteroid injection use resulted in higher rates of patient reported global improvements and lower pain intensity in the short term (at eight weeks), compared with a wait and see approach. Education plus exercise was also better than corticosteroid injection use. Education plus exercise showed better global improvement than corticosteroid injection use over the long term (52 weeks), but with no difference in pain intensity between the two groups. These results support the use of education plus exercise as an effective management approach for gluteal tendinopathy. We thank the participants who volunteered to participate in the study and the clinics that carried out treatments and imaging. Contributors: RM contributed to the study conception and design, recruitment of participants, management of study proceedings, data collection, and drafting and revision of the manuscript. AG, KB, and PH contributed to the study conception and design, and drafting and revision of the manuscript. PN contributed to the recruitment of participants, management of study proceedings, and data collection, and reviewed the manuscript. JK contributed to the statistical analysis and reviewed the manuscript. HW contributed to the study conception and design and reviewed the manuscript. BV contributed to the study conception and design, recruitment of participants, data management, and the drafting and revision of the manuscript. BV and RM act as guarantors and take responsibility for the integrity of the data and the accuracy of the data analysis. The corresponding author attests that all listed authors meet authorship criteria and that no others meeting the criteria have been omitted. Funding: This trial is funded by a National Health and Medical Research Council (NHMRC) programme grant (#631717). KB is supported by an NHMRC principal research fellowship (#1058440) and PH by an NHMRC senior principal research fellowship (#1002190). The funders of the study had no role in design and conduct of the study; collection, management, analysis, and interpretation of the data; and preparation, review, or approval of the manuscript or the decision to submit for publication. Competing interests: All authors have completed the ICMJE uniform disclosure form at www.icmje.org/coi_disclosure.pdf and declare: support from the NHMRC for the submitted work; no financial relationships with any organisations that might have an interest in the submitted work; no other relationships or activities that could appear to have influenced the submitted work. Ethical approval: Obtained from the human research ethics committees of the Universities of Queensland (#2012000930) and Melbourne (ID 1238598). Data sharing: Data and statistical analysis plan are available through mediated access at: https://espace.library.uq.edu.au/view/UQ:409744. The senior author (BV) affirms that the manuscript is an honest, accurate and transparent account of the study being reported, that no aspects of the study have been omitted, and that any discrepancies from the study as planned/registered have been explained.
. The pain catastrophizing scale: development and validation. Psychol Assess1995;7:524-32doi:10.1037/1040-3590.7.4.524.
. The EQ-5D health-related quality of life questionnaire. In: Preedy VR, Watson RR, eds. Handbook of disease burdens and quality of life measures.Springer, 2010: 87-99doi:10.1007/978-0-387-78665-0_5.
. Multiple imputation and its application.John Wiley & Sons Ltd, 2013doi:10.1002/9781119942283.